Young and old came face to face in the final of the New Zealand Professional Bowls Association national qualifiers in Hastings last night. So who do you think won at Bowls Heretaunga in the quest for a berth in the World Indoor Singles Championship at Potter’s Leisure Resort, England, in January next year? 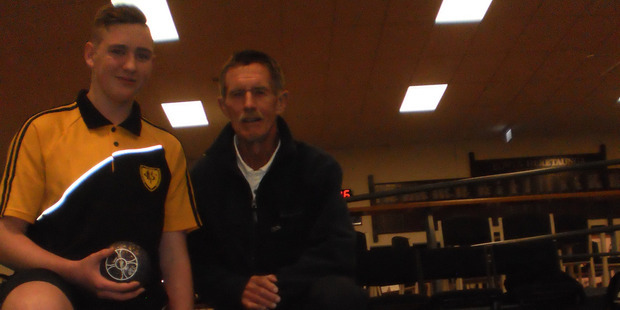 Strictly speaking youth, in the shape of Bradley Down, of Wellington, prevailed when he beat Ian Mason, 75, of the Havelock North Bowling Club. But the code was the emphatic winner, if Mason’s endorsement of his nemesis is anything to go by. “I like to see more people of Bradley’s age playing,” said Mason whose loss on the last end sat on “13th to the tiebreak”. Mason said bowls offered so much more so it was imperative youth embraced the code in their formative years. He wasn’t disappointed not to win last night as Down, of Victoria Bowling Club, jets off to Dunedin for the deciding round of qualifiers as winners from the other four centres will be pitted against each other from September 9-11 to see who will earn the right to compete for more than £50,000 ($92,000) in England. “At my age to get to the final is pretty good,” he said, revealing he and clubmate David Jones got to the semifinals of the NZ PBA pairs in June. He felt the final against Down could have gone either way because both treading “a very fine line” in his 9-4, 3-8, 2-1 defeat. He ruled out “luck” for the success because it required dexterity for the teenager to make a statement in the last end of the tiebreak. It was a day of dramatic finishes for Down, running the gauntlet of some of the Bay’s seasoned campaigners. The kitchen hand, who left Onslow College in the sixth form, sat a bowl through for four shots to win his quarterfinal against Paul Sorensen. He squeezed through the narrowest of gaps to trail the jack perfectly and win his semifinal over the home club’s Gavin Keighley. His character and fortitude surfaced at the last end of the fourth tiebreaker of the day, with four close bowls to beat Mason in the final, removing any suggestions of fluking his way through. “He didn’t quite give me a chance to get in [so it’s] a fine line because I could have done the same,” said Mason, who is off to the national final of the New Zealand Tiger Turf Tournament in Auckland on August 27. Bradley, who had no motivation to achieve in school, has hopes of carving a career in commerce or urban planning. He got into bowls at 11 after his parents, Cindy and Graham Down, used to take him to the club so they could play. “I couldn’t say at home or do nothing [at the club] so I thought I may as well join in and use my time better,” said the teenager, whose 15-year-old sister Amber got serious about it recently. “I got hooked, which is a strange one,” he said, finding bowls challenging but also feeding off the buzz in excelling. Now he has made some friends among a group of under-21s around the country. “I’d recommend it to anyone because I’ve made some lifelong friends,” said Down, whose expectation in his maiden NZ PBA tourney here was to win perhaps two games. “This has come as a bit of shock to me,” he said, dipping out in Saturday’s quarterfinal, which No1 seed Murray Glassey won. However, Glassey lost first up to Heretaunga mate Dean Drummond yesterday. “I had no pressure to succeed so I think that worked in my favour,” he said, enjoying his status as an unknown quantity. Down played shots that were “not obvious” draws, looking to convert higher and more effectively. he didn’t think too many players would attempt those. Down likes to believe he’s aggressive but is mindful sometimes it pays to curb that desire to shoot from the hips. He echoed Mason’s sentiments, struggling to find any major points of difference on why he came through. “I was fortunate in some shots and got a bit of luck but I think those are the moments you need to capitalise on in a game,” he said, suspecting he had more of those moments but all in all it was a tight affair. Down intended to conduct some research on the other Dunedin-bound qualifiers. He doesn’t lack incentive in trying to jet off to England, having only returned from there two months ago after visiting relatives. Down said the bonus with such tourneys was playing against the likes of Glassey, win or lose, for experience. Victoria also featured well in the New Plymouth qualifier with Jayden Ravji reaching the semifinals of the World Indoor Singles tournament there before falling to winner and last year’s qualifier Debbie Wilford (Taranaki) 6-8, 7-12.